I've had great difficulty finding any small ovens with quartz type heating elements, though it may be possible to replace the metal bar heaters in some models. The Roller Grill model is only on the list because I liked the way it looks - at £400 it's far outside my budget, and it is also a little bit too large. The Dualit oven is similarly designed, with very little plastic and no painted surfaces, and a much better size, but the current model has been getting terrible reviews and costs too much! The most solid and best looking of the others is the Steba KB14, which has plenty of insulation and few plastic parts, but this is also a bit pricey and maybe not quite large enough on the inside to handle laptop motherboards. It also has some kind of coating on the inside, but I do not know if this is a Teflon or ceramic type. The Abode oven has the best internal dimensions, and also ticks most other boxes, but it has a painted exterior with lots of plastic parts and looks kinda ugly. Comparing internal/external dimensions it is clear that it also has little insulation. The Dema pizza oven is an interesting option, with a stainless catering style exterior and shaped heating elements that cover a large area. The internal height of only 6cm makes it useless for a lot of things though, and I worry that the short distance between elements and PCB will make heating very uneven (despite the larger heating elements). Edit: I've updated the table above with additional models. I'm using the Steba KB11 as reflow oven in combination with a reflow controller. It ramps up round about 1°C/sec. The thermal switch is a bit annoying on multiple runs because you have to let it cool down quite a bit or it will stop heating while ramping up. Btw your Volume is wrong it 8 L (so 125 W/L). But i have to admit that i'm only using this oven to reflow my own PCBs and not for repairing motherboards. Many thanks Owen, interesting to hear about the KB11 - I included it as I thought it looked really good and I love the small size! It's also the only one on my list that uses quartz heating elements. And thanks for the volume correction - I'll update my table to reflect this. If the only reason for getting an oven was to do my own boards, then it would be my model of choice, but for other uses it's just a little bit too small. I also worry that even if a given laptop MB would fit (and many probably would) the absence of a fan and the single elements might mean that to reach reflow temperature on the problem chip (usually the GPU) other areas of the board might be overheating. That said, I suppose MB repair could be done with a hot-air-gun instead - but then a quality hot air gun is what I should get, and I couldn't use that for any of the other things that an oven could be used for. I've been over these lines of reasoning many many times and keep coming back to how useful it would be to have an oven with a ~30cm internal width, and tall enough to take a cup or painted object (~10cm). I also already have a Weller hot-air pencil, and a Portasol gas pen, which do most of the things I need hot air for - though neither will reflow a large chip reliably. P.S. If you're having trouble with the thermal switch, why not just bypass it? Can anyone help fill in the missing info on the Lakeland Mini Oven? These are available refurbished for ~£60 and may be a great candidate; I suspect they are made by the same people who make the Breville BOV800XL Smart Oven which has received rave reviews, particularly for providing very even heat (but is only available for the US market and 120V). I think the Breville has quartz heating elements, so maybe the Lakeland does as well? They do look quite similar - see photos. I think I might have found a candidate which uses quartz elements, and four of them (2/2) as well, for a rated total of 1.5kW. It's a little big though, at 20L, and 5cm wider than the Steba KB 14 (my current #1 choice) - and it doesn't have a convection fan. The question is: just how desirable is it to have quartz elements? This oven can supposedly reach 230 degrees in just 3.5 mins (~1 degree/sec), which sounds quite fast for such a large oven. Is it worth trading off on convection, insulation and size just to get quartz elements? Or is having a fan more important? I really have no idea! You have to be careful with fans as I have found that they can move the small SMD components around. Thanks Derek, that's a good point! Though I guess that I can disable the fan for all or part of the cycle if this becomes a problem. I've seen it mentioned in several places that having a convection fan is a good way to avoid hot spots, which if you're going to reflow large/expensive/irreplaceable boards (like laptop MBs, or graphics cards) may be a big problem. I would have thought the fan would need to be quite powerful to shift components, but then maybe they are - I've never used one of these little ovens so I don't know. Maybe it's not the airflow that causes problems, but vibrations from the fan motor? If so, I suspect this can be improved by dampening the fan motor mount. I'll be interested to see what you go for and how well it works. When I was looking I found there was hardly anything available in the UK. I ended up going for something 9L and very cheap from Robert Dyas. Not great but works well enough for my small boards. Even with some welding blanket insulation it gets too hot to want the controller (and cold junction compensation) inside the oven enclosure. I bought one from Currys a while back. At the time it was the cheapest one they did (£24.99) and was branded as LOGIK (their own brand). It looks exactly like the Abode one you listed except the middle knob doesn't have the fan selection as mine doesn't have a fan. I built my own PID controller which has a 13A socket on it, and just feed the thermocouple in through a small gap in the front door. To use it, I select the stay on option on the bottom knob, turn the top knob to max, and select both top & bottom elements on the middle knob, then plug it into my controller and off I go! It doesn't seem to have any problems following the profile for lead free solder I programmed into it apart from the cooldown phase where I have to open the door. I guess that I can disable the fan for all or part of the cycle if this becomes a problem. You can reduce the fan speed to approx half speed by just adding in a 1N4004 diode in series (if it is a 240Vac fan that is). Small components like 0603 etc are the ones that get pushed around if the fan is too strong. A lot of this depends on how much heating is actually being done by infrared. The fan helps with convection, but not direct infrared. You will find by experimentation which way to place your boards in the oven to avoid the larger components "shadowing out the infrared heat" from the smaller components. Depends on the type of fan. I've not taken apart a convection oven but small fans tend to be shaded-pole motors, which can't be speed-controlled like this. You'd probably be better off controlling it by blocking part of the airflow. I'll be interested to see what you go for and how well it works. When I was looking I found there was hardly anything available in the UK. I ended up going for something 9L and very cheap from Robert Dyas. I did look at Severin after seeing the EEVblog videos about the reflow kit from Beta Layout, which is based on the Severin TO 2034. This oven doesn't have a fan though, and it's a little big (20L), and it has a painted exterior with a lot of plastic. In my mind an Arduino controlled oven can be useful for many things - not only reflowing PCBs - some of which may require much higher temperatures than it was designed for. For this reason I'd prefer an oven that has a stainless exterior with few plastic parts, and a plain aluminium or steel interior that isn't coated (or has a ceramic coating). It may be an ambitious goal but it is my plan to buy preciesly one device to serve as "that box I can put stuff into to heat it up real good". For this reason I am now leaning towards the Dualit or Lakeland ovens (see below). Yeah, I've seen that one, and it is indeed very similar! As with so many things these days, doing product research is greatly complicated by the fact that no-one makes anything any more; the label on the product bears no relation to where and by whom it was made. There's probably an entire city in China somewhere which only does mini ovens, with whole families spending their entire lives inside in a giant factory/labour camp churning out flimsy junk that is then stamped with Brand X for consumption by gullible westerners. Bosch, Black & Decker, Severin, Steba, Dualit, Breville - they are only brands today and the actual manufacturer is probably the same anonymous state-owned sweatshop. When I get round to replacing the controls on my oven I'll look at including a mechanism that can open the door programatically - I reckon a linear actuator (not a solenoid!) like this one should be able to push open the top of the door wide enough for cool-down without disturbing the soldered board(s). A lot of this depends on how much heating is actually being done by infrared. The fan helps with convection, but not direct infrared. You will find by experimentation which way to place your boards in the oven to avoid the larger components "shadowing out the infrared heat" from the smaller components. That makes perfect sense, good point! I guess this explains why it's so hard to find a convection oven with quartz elemets, which (I think) produce more radiated heat than the metal type elements? To be honest I'm not that worried about the fan; I know I would prefer an oven that has one, but should it turn out to cause problems I can probably modify it somehow to fix this - or in worst case not use it at all during the reflow phase. A fan will be useful during the other stages, as well as for many other things (e.g. for drying silica gel pouches, which I have and use tons of!). What do you guys think? Would you choose a different model - and if so, why? 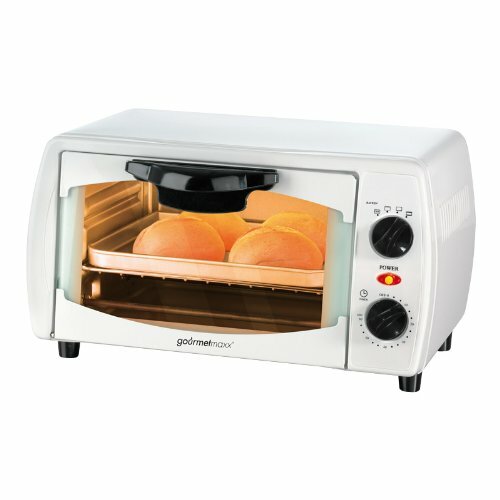 Side note: I found some great looking mini ovens from Panasonic, which are only available in Japan and only as 100V models. So while they look pretty nice, they're not on my list, but I wanted to show them anyway Putting the control panel below the oven door seems eminently sensible to me, when designing a unit for small footprint/bench-top use. I don't understand why this configuration is so rare? The only ovens I've found on the European market that are laid out like this are from Moulinex (see updated list in first post), and these look quite flimsy. I wouldn't call it trouble it's just a thing to watch out: I did some measurements and cycled the oven 5 times from 25° up to 230°C, let it cool down to 50°C and so on. While doing this i've noticed that the switch came earlier with after the third cycle and it took longer to reach 230°C. It wasn't a show stopper and after 60 boards or so with this oven i'm not worried about it because every single board went well (up to 4 layer boards with 0201 parts et cetera). So it became my trusty little reflow setup . Ok, since no-one jumped in to stop me, I have now purchased a (refurbished) "Lakeland Electric Compact Mini Oven" for £65 delivered. As tempted as I was by the Steba KB 14, which has many pluses, the non-coated cavity and stainless exterior tipped the balance in favour of the Lakeland oven. It's also much harder to get hold of (it was discontinued some time ago) and the only source I was able to find only had six of them left (now 4) - I figured I'd better take the chance now, before they're all gone. If anyone else is interested, this is the eBay listing. I don't think you'll regret your choice, it looks like a nice oven. Just a heads up on the Severin though: the only plastic it has are the knobs, the handle and the feet. Pretty much like the other ovens you listed. I don't know what to think regarding convection vs. just heating rods. Maybe it doesn't matter since there is so little volume and I remember some claiming that the heating ramp was not fast enough compared to pure rod ovens. No idea. I don't think you'll regret your choice, it looks like a nice oven. Just a heads up on the Severin though: the only plastic it has are the knobs, the handle and the feet. Pretty much like the other ovens you listed. I don't know what to think regarding convection vs. just heating rods. Maybe it doesn't matter since there is so little volume and I remember some claiming that the heating ramp was not fast enough compared to pure rod ovens. No idea. Thanks Neganur - it's a silly thing to get exited about I guess, but I'm really looking forward to having the ability to "cook" things in the workshop. There have been times when I've had to use my (not very clean) kitchen oven for non-food jobs, and I've been equally worried about the burnt gunk it's covered with contaminating my projects and the possibility that the next pizza I make might kill me Not to mention not having the faintest idea what the actual temperature is, or the over-powerful convection fan at the back disrupting things and splattering them with all sorts. I do a lot of spray painting of small parts, and the ability to "bake" what I've painted in a clean environment is very welcome. And I've got a MacBook Air 11" with a glitching GPU that I hope to fix by reflowing the motherboard. And I've got a whole bag of 25g silica gel pouches which have been "used up" and need drying out (living by the coast I'm dependent on these). In short; I'm sure this oven will prove a valuable addition! Thanks also for the additional info about the Severin ovens - I thought much of the front was plastic on these, happy to hear that's not the case(! ), though I think I'd still go for the one I picked; while the convection fan might not be that useful for reflowing PCBs, it is essential for many other jobs, and I do like the stainless steel housing. One way to improve the thermal responsiveness would be to add additional heating elements, I've seen this done for DIY reflow ovens, and even some where the metal elements have been replaced by quartz ones. Just having the enclosure opens a lot of possibilities I think! Sounds perfect. I hope it works out well. It'll be a bonus if the electronics area stays cool enough to put a reflow controller in there. Set to 230° (the highest setting), and with the convection fan switched on, it takes 3m45s before the controller switches off the heating elements. I'm still waiting for the digital thermometer that I've ordered to arrive, so I have no way to verify if indeed it reaches 230° - or even overshoots it - but based on this simple test it does look a little sluggish. I will be adding ceramic fibre insulation mats to the sides and bottom, which currently have no insulation, and I need to see what the back looks like as well (I forgot to check this when I had it open!). If I'm still unable to get a ~2°/s ramp-up I might look at adding an extra element at the bottom, and maybe one at the top as well. The overall build quality is as one might expect from a cheap Chinese oven; all sheet metal is of the thinnest and softest type, and one has to take care when dismantling so as not to cut oneself. It is also very easy to bend and dent things, and care must be taken not to overtighten any screws. The exterior shell is not "proper" stainless steel, but some cheaper ferritic alloy (400 type), which became clear when I was trying to navigate my magnetic bit-holder with screw deep inside during reassembly; the bit-holder (and screws!) would happily stick to the shell, making reassembly a rather frustrating exercise. You might want to rest the aluminium sheet on top of the steel grate, which is fine. Just remember to remove as many of the grate bars as possible to reduce thermal mass. 3. You should consider adding an additional heating element, especially if you plan to use lead-free solder paste. The rate of rise of temperature in the reflow phase is pretty steep. Reducing hot and cold spots is very important. A well insulated, powerful oven means the heating elements don't have to be on 100% of the time. As you might imagine, a brightly glowing element can easily create a hot spot. Another thing to consider is the direction of the heat; ideally the top heating elements are not used much to minimize the exposure of the components to heat. This is especially true if the oven's elements are infrared, which is better absorbed by dark components (like microcontrollers) and reflected by lighter ones. It is good to see your oven uses resistive elements - this is a plus. Your list of ovens is very useful. I make and sell ControLeo2 reflow controller and often have customers in Europe asking me to recommend ovens. If your oven uses calrods ( 6 to 8 mm diameter heater rods ) consider adding cooling fins onto the rods to improve effectiveness of the fan. These cooling fins often come as a sheet metal spiral to enhance the heat transfer from rod to air. If unavailable attach aluminium strip to the rod to improve heating effectiveness. Do not be worried by increased thermal mass of the heater. IT IS ALL GOOD. You need an oven with decent thermal mass to ensure proper process window. You achieve good effective thermal mass by controlling temperature which is further enhanced by the action of convection fan. At 1.3Kw the oven will not be able to handle a multilayer board. You will be lucky to process a double euro format double sided board in the oven. Seriously double and triple installed power or at least increase installed power to reach the limit of the householed power socket ( may be 2.5Kw). Thank you, some great tips there! I'll definitely keep an eye out for those spiral heat-sinks, sounds like a simple way to improve the performance a little bit. TBH, I haven't really used the oven to do any reflows, apart from a simple test on a piece of veroboard, which came out brilliant. I have used it to dry two lots of silica gel pouches, heat up a piece of acrylic i needed to bend to a shape. and to harden the paint-job on a tripod mount for a vintage camera I've been restoring (pictured). It works very well, and I'm happy with my purchase! Is it worth adding this oven to the thread?